There are now quite a few brain entrainment programs out there on the market, and essentially they all do similar, if not the same, things. Holosync continues to be very popular but fairly expensive, and the company behind the program, Centerpointe, are arguably the leaders in this field. But last year, a new player entered the market and changed the face of brain entrainment as we know it. Genius Brain Power provides everything Holosync does, but at half the prices, and, is arguably more powerful. When I say that each program essentially does similar things, what I mean is that they all use special sounds to create similar meditative states. Holosync uses binaural beat technology, and another popular program called Quantum Mind Power, uses monaural and isochronic tones. 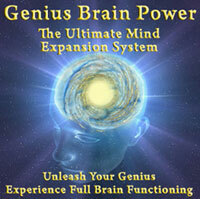 Genuius Brain Power, however, is comparatively different. It uses computer generated rhythmically pulsed beats to put you into the meditative state. The key difference between Genius Brain Power and Holosync is that you can actually hear the beats, which can be unnerving, and I definitely prefer Genius Brain Power in this respect. I’m pleased to say that after doing many sessions of Genius Brain Power I have not found these beats to be annoying, in fact, if you focus in on them you simply go deeper into meditation. I can liken the experience to using a Mind Machine, something i did some years back, and although I’m not an expert on the technology behind it, I’m pretty sure the Mind Machine uses sound pulses similar to those in the Genius Brain Power program. The good news is that I have actually found using Genius Brain Power more pleasant then using a Mind Machine, probably because of the very cool music and sounds. The fact that you do not need to focus on the flashing lights that a Mind Machine employs adds to a more comfortable experience. I look forward to the sessions and I am pleased to say the program now forms part of my weekly meditation routine. Does Genius Brain Power Actually Work? Using this audio program, especially with the Delta state recording, I have gone into very deep meditative states followed by periods of extreme productivity. I feel very creative and ideas flow effortlessly. I feel energized and ready to work hard. Whether or not I am actually increasing my IQ and getting smarter is hard to tell. The program claims that the pulsed tones actually cause your brain to become smarter, but for me this is hard to prove, perhaps over time I will gather more conclusive results. That said, my take on this technology, is that when we are in more relaxed states we are able to function on a much higher level then if we are stressed out with no way to release. Sure, that is not rocket science, but the simple things are often the most effective. So with this in mind, it is very likely that we help the brain toward performing at optimum level. Recently (and very often in my life), I have been working on some pretty big projects and have not been getting as much sleep as I normally would, also my energy levels are a bit low through lack of exercise. Since the GBP package turned up a couple of months ago, I have felt like I have had something to keep my mind clear and defragmented if you like. I have been able to function well despite having a schedule that is busier than it would normally be. This has lovely classical music from Vivaldi, Bach, Handel, Mozart, Pachelbel, Gluck and Mendelssohn. This is one of my favorites because I love classical music and have been using it as a relaxant for many years. You’ll hear energy expanding didgeridoo music, mixed with beautiful sounds such as bird tweets and I’m sure I heard an owl in there! This recording as well as the 42 minute one can be used while you are working or up and about. This also has classical music. I like to use this while working on the computer. I normally keep it fairly quiet on my headphones, although it is not normally distracting to what I am doing. This level corresponds to extreme relaxation, trance, deep meditation, creativity and REM sleep. Also, at the theta frequency your brain releases endorphins into the bloodstream, which make you feel good and promotes healing. The deepest you can go, corresponding to dreamless sleep, growth hormone release, healing and ultra deep trance. You also get a handy online manual that has further information about the process of using pulses to generate a meditative state, as well as usage instructions to get the best out of the program. At $97 this is one of the cheaper programs out there, this may actually put a few people off, but the production value is very good, and just as good as other package I have tried. There is a 180 day money back guarantee should you change your mind. You will be able to achieve a refreshing and deep meditation, and a relaxed but very alert positive focus. All the recordings you’ll ever need are included. Solid customer service with great email support. As mentioned previously, you do hear the sound pulses and this may put some people off. However, I have found that I either don’t focus on them (if I am working with the music playing) or, I do focus on them (if I am lying down and using the music to have a deep meditation) and this puts me into a deeper more relaxing state. You do not get the online course and access to a member of coaching staff that you would get with the more expensive Holosync program.